The festive time is around the corner! The markets have got in a mood to celebrate and the promotion schemes are trying to outdo each other in alluring the customers! The malls and eating places are overflowing with people and that too in times when the dollar and inflation continues to head northwards! I stop by on a pavement shop in the crowded market where a small child and his sister who both would be less than ten years old ask me to buy the earthen pot called ‘Karwa’ for the forthcoming festival. I am immediately struck with the innocence writ over the faces! My mind wafts into the memories of a bye gone time! I and my brothers would wait eagerly for the Dusshera holidays and get busy with the onset of autumn break into activities which not many would consider to be sane in today’ world. Building our own effigies of the demons Ravan, Kumbhkaran and Meghnath! We would work with the bamboo canes and old newspapers to give shape to them. The onset of Navratras would herald the beginning of preparation of sweets for festivals at home. We bought new clothes from the Gandhi Ashram made from homespun cotton. Ramlila would commence on this day, and stage performance of the epic ’Ramayan’ was enacted in the neighborhood. The first day was a day of fast where we would be treated to a variety of different kind which would comprise of anything other than whole grains or their derivatives. The sixth day marked the commencement of Durga puja mostly celebrated by Bengali community but we participated with equal gusto lining up at pandals from early in the day to watch the statues of Durga astride a lion killing demon Mahishasura being setup! Later in the day we would line up for the prasad( an offering) of Khichdi( preparation of rice and lentil)! In the evening there were ‘Jatras’, musical events, and movies where every Bengali girl and woman would come dressed in finery and new clothes setting the hearts aflutter while the male counterparts dressed in white kurtas and dhoti! On the eighth day, we would be treated to Semolina Halwa( a sweet), Puri( puffed bread) and Chana(chick peas) with some small coins as gifts not only at home but even by our benevolent neighbors! The saving came in handy to buy the bows and arrows and swords on the tenth day, Dussehara where a big fair would be held in the lawns of adjacent parks ! 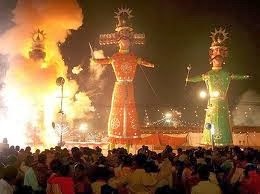 The event culminated with the effigies laden with crackers going up in flames with thunderous noise! Our own mini Ravans were alighted when the crowds were returning after attending the bigger spectacle to stop by and watch with curiosity the smaller effigies being set afire! It would be a moment of our triumph to see the swelling crowd watching our own small effigies going up in flames! In the later years when I got an opportunity to travel around and saw the Garba and Dandiya (dances) where both men and women participate from evening till late night in Gujarat and Maharashtra! This is the best time of the year when the weather is agreeable and the winter is setting in! A lot has changed over the years but Ramlila , Garbas, Dandiya, the Jatras have become more flamboyant ! The small fairs have been replaced with swankier settings with impromptu dance and fashion shows in malls! The festivities would now continue till Diwali and beyond into the New Year.It is time to celebrate so who cares!! Ah and in my home, we hardly do any of the ritualistic stuff but do enjoy the festivity in the air. Kids have holidays :). You brought in the festive mood to those that couldn't celebrate for a reason or two, so beautifully you have covered the activities that have been associated with this festival for years now! You also made me nostalgic, my mom used to plait my long hair with jasmine buds, I wore new dress and went with my sister to other homes to look at the Navaratri kolu.(dolls)! Ah, your country certainly knows how to be festive! Dussera is a beautiful time of the year. I love visiting neighbors who display dolls. It is a time for getting together, catching up, dressing up and recalling past experiences. Loved the post, Rahul. I love India for giving us so many festivals! I am so happy that someone shares just the same thoughts as I do. Vidya when it comes to celebrating:)Thanks a lot! Festive season bring out the best days...time to rejuvenate, experience the real happiness and love! I'm trying to feel excited about the sanitized version of Puja and Diwali we celebrate here. It's during festivals, I miss Delhi the most. Purba, you reminded me of Khushwant Singh who once on return to India wrote, that the moment he landed in India , the familiar smell, the crowds and traffic jams is what he missed while staying abroad:) Wish you and your family a lovely Pujo time , though it would be subdued !! Happy Festive season to you too! Latha, you may not be festive type but if you like to wear new clothes and enjoy good food then, you are just with the rest with your own identity:) Have a lovely time with your family! From Raksha Bandhan till Diwali...it is just festivity. For us,it is time for entire family to get together . yay!! 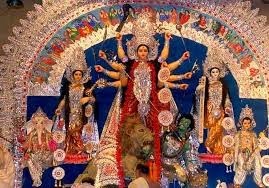 it is festive time...for me , as a bengali ..nothing is more exciting than durga Puja!! Nice and interesting posting ..
You have so amazing many festival. 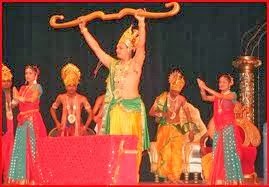 Dandiya looks so interesting. Everyone has something like sticks. 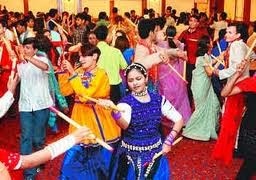 It is fun time all over the country and yes Dandiya dance is with sticks! Hope you see it some day :) Thaks a lot, Sarah! So colorful festivals. I have heard and watched a lot on tv but never got a chance to participate. Such a nice description of the festival and the Ram lila. Happy Navaratri to you and your family! Even though many of us have stopped celebrating festivals in a big way, yet the significance of these festivals remain etched in our minds forever. Yes, the festival celebrations are real treat! Garba especially, love it! what an amazing post :). Wow, even kids in our colony build the efficacies, we used to collect money from everybody to put crackers in it. And making sweets and ashtami pujan is still part of my life. This type of the year, I am very busy with cooking, cleaning and decorating. I love following our traditions. Wish I can attend gharba once. Your description of the festival is very nice! Though I knew about Ramlila and Durga pooja but not in detail! Thank you! In south we keep dolls in steps, 5,7 9 steps. Dashaavataar, Rama Pattabhisheka sets, Lakshmi, Saraswathi dolls etc. An old Chettiar doll (here, in Tamilnadu, they are the main business people!) with a hug tummy will sit with his wife surrounded by provisions in small small vessels...brass or wooden set, is a must! We make a small garden with sand and spray some mustard seeds or coriander seeds which will start sprouting in a couple of days. The imagination will be visible in different golus in different houses. Some people keep golus with a theme like Independence day, cricket and so on! It is interesting. But now, with both husband and wife going out for work, the tradition is slowly disappearing. Enjoyed reading this post of yours, Rahulji! I love the idea of long holidays... we don't really have those here, most of them are just one day. Nice post Rahul.We enjoyed every festival to the hilt just like you have described but today it is not like that at all. Thanks Indu, for liking! Yes with changing times the ways to celebrate are also changing! Thats such a nice post! Full of festive spirit! As a child, I once made a small effigy of the Ravan with my friends! 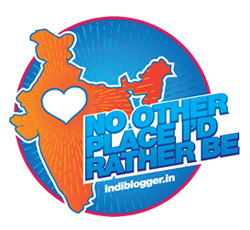 Welcome to my blog, Shaivi and it feels good to find some one indulging is similar fun in making effigy:)Thanks a lot! Navaratri is one of the festival s where kids enjoy as they get vacation from school to attend all festivities. Very true! Time for children to have a blast! We Tamilians have something called 'golu'. We have AN arrangement of dolls on steps at home. It's a season for creativity and friends and families visit each other's golu. 'Sundal' a dish made of boiled lentils or beans is made everyday . Me actually having a lot of fun this navratri with my own small golu and visitors coming in daily. Jaishree, It feels so good to see someone carrying on the traditions in far away Singapore and decorating the house with golus and preparing Sundals! Incidentally, my daughter too is there and tries to follow the traditions like you:) A huge thanks to bring the aspect of 'golus' and wishing you and your family a lovely festive time!! Ah, I vividly remember the Ramlilas of my neighborhood, how excited I would be as a small kid to see all the characters live and watch the event unfold. Now, all these have faded somewhere... how I miss them. Festival days of childhood were so much more simple yet filled with so much more fun than what they are now. Hi Rahul, thanks for giving us a literary glimpse into this colourful and exciting experience, this is the first time I have read anything about it, sounds really intriguing and fun of course. The festive atmosphere and unity amongst people must be truly something special. Happy Holidays! Interesting memoir. Dandia has become purely commercial. In this part of the Country, various News Paper group organise it in different parts of the city. As far as my own childhood memories are concerned, the locale was a tribal area and huge wooden chariots were taken round the town. The season is making you all nostalgic, I see. :) I hope you have been enjoying all the festivities.